Perennial herb from a slender rhizome; stems erect, sometimes prostrate and matted, simple, few to several, smooth or hairy, 10-50 cm tall/long. Basal leaves lacking; stem leaves alternate, long-stalked, clover-like, the blades 1-5 cm long, the leaflets broadly heart-shaped, folded towards each other, smooth or the margins hairy. Inflorescence of 2-7 flowers on smooth or hairy stalks 5-15 cm long; petals yellow, 4-9 mm long, entire; sepals 2-5 mm long. 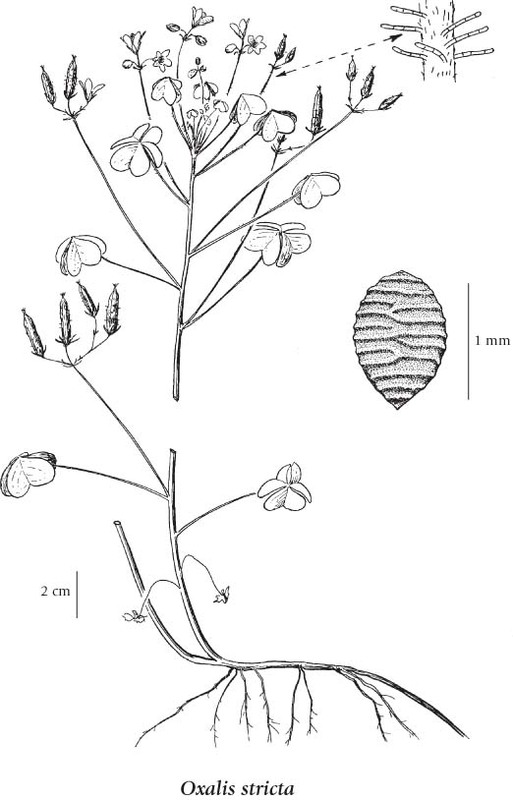 Capsules, oblong, 8-15 mm long, sparsely long-hairy, the hairs with partitions; seeds egg-shaped, 0.8-1.2 mm long, cross-ridged. Moist disturbed areas and ditches in the lowland zone; rare in the lower Fraser Valley; introduced from the U.S.
Oxalis europaea var. bushii (Small) Wieg. Oxalis stricta var. piletocarpa Wieg. Oxalis stricta var. rufa (Small) Farw. Oxalis stricta var. villicaulis (Wieg.) Farw.